You better beef adding these 15-minute roast beef dip sandwiches with purple sweet potato fries to your dinner menu. They are fresh, healthy, and incredibly simple to make. 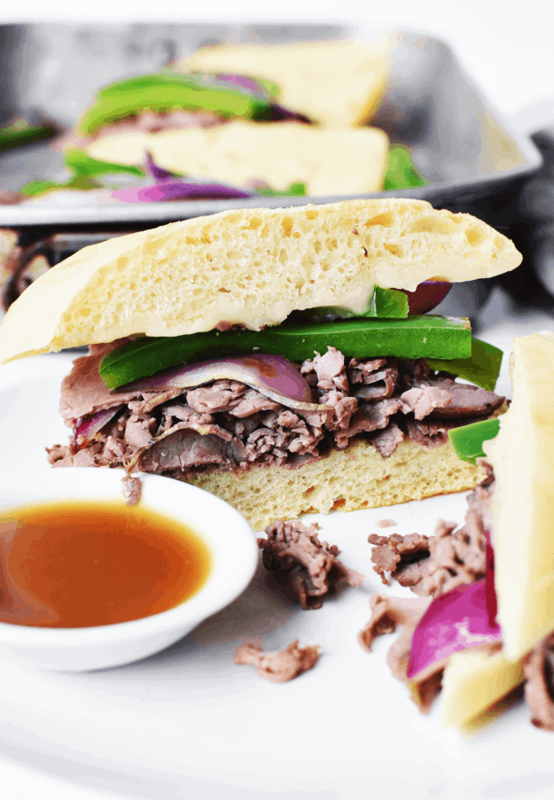 This is the mom-on-the-go version of the classic French dip sandwiches. Although I do love a good slow cooker roast beef dip sandwich, I default to this meal about every other week. It upgrades a regular deli sandwich, and since it is warm, it’s perfect for a days where you want quick comfort food. 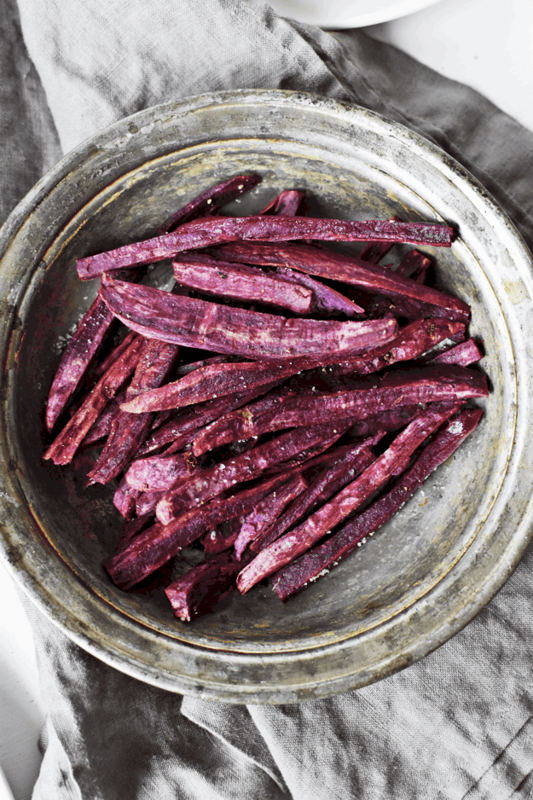 Now let’s talk about these PURPLE sweet potato fries. My heart rate elevated with excitement when I saw the bags piled at the entrance of Trader Joe’s. It’s not everyday you get your hands on purple sweet potatoes. Without a special trip to the farmer’s market, anyway. I immediately grabbed a bag and tossed it in my cart, knowing they would make the coolest french fries. I told my boys they are Ninja Turtle french fries, specifically what Donatello eats to stay strong. And purple. It worked like magic. The best way to cut these is in with a mandolin. I use my spiralizer because it has a julienne cut, French fry style attachment. 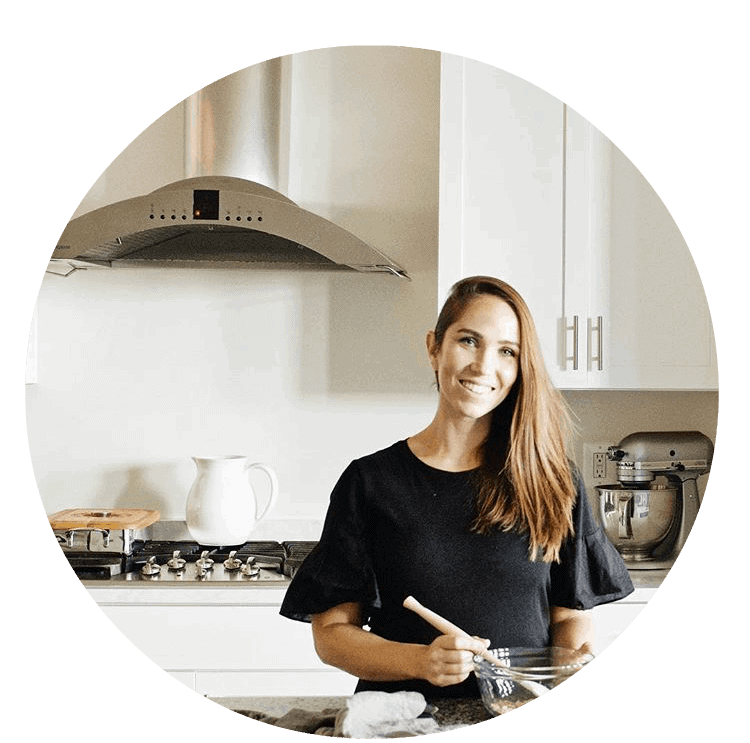 Or you can do them by hand, if you’re a whiz with your knife skills. Either way, they make stupidly delicious purple sweet potato fries! 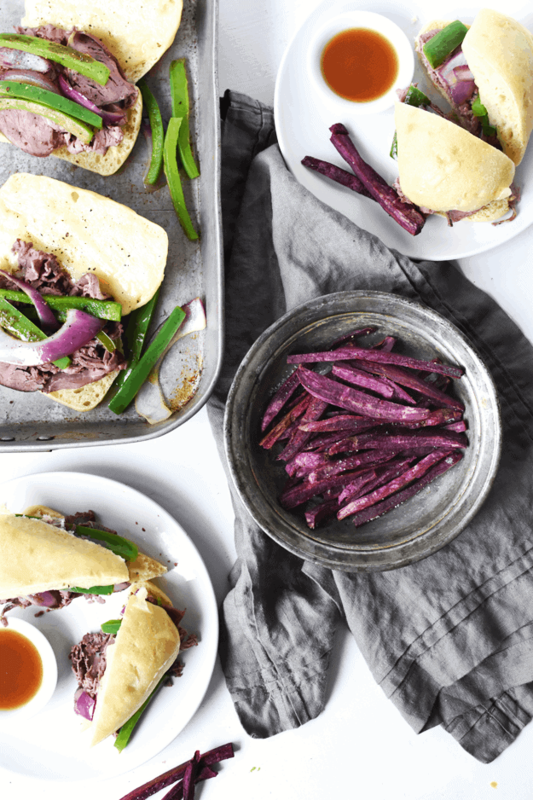 Grab the recipe to these 15-minute roast beef sandwiches with purple sweet potato fries below. Enjoy! You better beef adding these 15-minute roast beef dip sandwiches with purple sweet potato fries to your dinner menu. They are quick, fresh, and healthy. A perfectly easy family dinner. In a skillet, grill the peppers and onions in olive oil on medium high heat, about 5 minutes. When slightly charred and tender, remove and set aside. Flip the hoagie rolls and layer meat and one slice of provolone on each sandwich. Bake for another 5-7 minutes until cheese is melted and bubbling, and the bun is toasted. 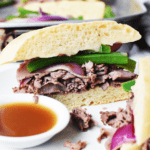 While sandwiches and fries are baking, prepare the au jus dip. In a small saucepan, whisk together beef broth, soy sauce, salt, garlic powder, and pepper. Heat over medium high heat, about 5 minutes, until warm. Top the baked sandwiches with grilled peppers and onion. Serve with 1/2 cup au jus dip and a side of fries. Enjoy! If you like this recipe, check out this recipe for smoked ribs or this easy grilled steak fajita salad.